The new Star Wars MMO could help grow the industry, says Blizzard's co-founder. Blizzard, the studio behind the immensely popular World of Warcraft, doesn't appear to be worried about the release of a high-profile rival like Star Wars: The Old Republic on the horizon; quite the opposite, in fact, as Blizzard's top brass seems to be rather hoping that the game does well. Frank Pearce, Blizzard's executive vice president and co-founder, said that if handled properly, the release of The Old Republic could help grow the MMO market, and that was a good thing for the whole industry, not just publisher EA and LucasArts. Blizzard CEO Mike Morhaime added that Star Wars was a strong brand and that BioWare was a great developer. He felt that The Old Republic would result in a lot more people checking out MMOs, and hoped that their experiences with TOR - and by extension, the whole genre - would be positive. Obviously there are also things that the pair aren't saying - there must have been some discussion at Blizzard about the potential negative effects that the launch of TOR will have on WoW - but it seems that they've decided to focus on the positives instead, at least in interviews, anyway. 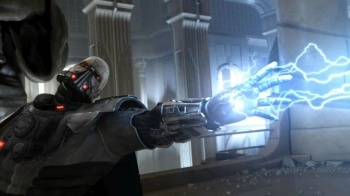 Star Wars: The Old Republic is scheduled for release in the second quarter of this year.